University of Lynchburg will name one entrance to Hall Campus Center to honor Thomas C. Tiller, who served the College for nearly 50 years as an alumnus, professor, vice president, and dean. 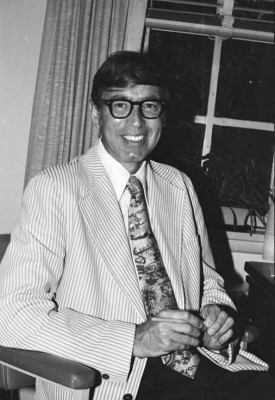 Dr. Thomas Tiller is seen in this photograph taken in the 1976-77 academic year. Source: University of Lynchburg archives. A dedication ceremony will be held on April 22 from 5:30 to 6:15 p.m. at the Dell-facing entrance that leads into Hall Campus Center’s Memorial Ballroom. Dr. Tiller, professor emeritus of education and human development, has spent virtually all of his adult life at University of Lynchburg. As a student-athlete during his own college years, he played basketball and also joined LC’s first soccer roster under Coach Bill Shellenberger. After graduating with his BA degree from LC in 1956, he earned a master’s degree in education from the University of Virginia and completed a doctoral degree at Florida State University. He came back to University of Lynchburg to teach in 1958, and subsequently was named dean of students, a post he held for two decades. Former University of Lynchburg President Dr. Carey Brewer appointed Dr. Tiller to serve as a special assistant and then as vice president for administration to help ease the transition when Brewer retired. When Dr. George Rainsford became president, Tom served as dean of students once again before joining the School of Education faculty where he taught in the counselor education program. He was a driving force in the Lynchburg and Virginia Counseling associations. He is a past recipient of LC’s T. Gibson Hobbs Memorial Award, which recognizes alumni for service to church, the community, and the College, and the Elsie Bock Award for Excellence in Citizenship. In 1994, as the senior faculty member, Dr. Tiller became the seventh college marshal, bearing the University of Lynchburg mace until his retirement in 2007 when the Thomas C. Tiller Scholarship was established by colleagues and friends. The scholarship is awarded annually to graduate students who have completed their undergraduate degree at University of Lynchburg.